Please join us for this 2-hour recitation practice, for the purpose of creating a good karmic connection with qualified spiritual masters. Tibetan Date: 25th of lunar month. See more at FPMT Dharma Practice Dates. A beautiful, profound practice (in Tibetan and English) where we make offerings to our Spiritual Masters and the Three Jewels, requesting them to grant us blessings and inspiration. 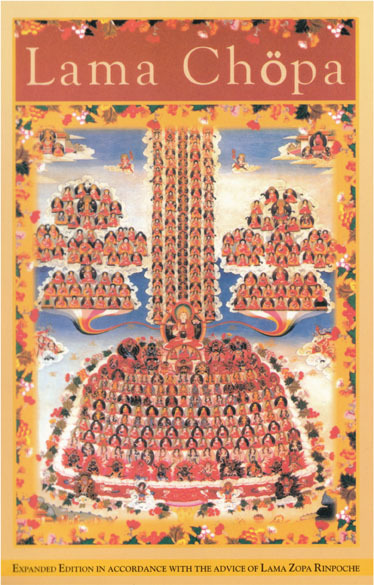 We will also make tsog offering – a commitment for those practicing Mother Tantra, which restores vows and pledges. The offerings of fruit, food and drink, which have been blessed during the puja are distributed among the participants and can be consumed by anyone who has faith in the Three Jewels. Donations You are welcome to a donation toward the offerings if you like, through the website or in person. If you want to bring your own offerings, arrive early enough to set those up. There is no set fee to attend. The donation choices below are just for your convenience.